Native to western North America, coyotes have increased in numbers and have increased their geographical range during the past fifty years, due in part to human modification of the landscape. Coyotes now are found almost everywhere in North America. They stand approximately 18 inches high at the shoulders and can weigh between 18 to 35 lbs. Coloration is usually a blend of rust-colored to brown to gray. The coyote resembles a small German shepherd dog, but with a longer, narrower snout and a bushy black-tipped tail. Breeding occurs once annually, typically in late January and in February, with pups born in March and April. Typically, even when denning in suburban areas, they choose sites where human activity is minimal. If disturbed, the parents may move the litter to an alternate den site. Litter size is normally 4 to 7 pups and may depend on the female’s nutritional status, which is a function of food availability and coyote population density. By late fall, juveniles may disperse to live independently, although if food resources are adequate, they can remain with their parents through the next year. Coyotes can be heard vocalizing (barking and howling) in the evening and night throughout most of the year, but they vocalize less when in the early stages of pup-rearing. Coyotes can live in almost any habitat in California, from arid deserts in the south to wet meadows and foggy coastal regions in the north. In recent decades, they have become more numerous in many suburban environments where an ample food supply is available. Some of the highest population densities on record occur in suburban Southern California. Coyotes are generally regarded as less social with each other than are wolves. While they can live successfully as solitary individuals or pairs, and often do so, they can form packs of up to 10 individuals in environments where abundant food is present. Therefore, dense populations of suburban coyotes may not appear to be highly territorial. Coyote diets are diverse and adaptable. Rodents or rabbits are often a major portion of their diet, when available. However, at times coyotes will rely on insects (such as grasshoppers), fruits, berries, songbirds, and carrion. Because domestic animals such as poultry, sheep, goats, and calves lack effective natural defenses against wild predators, they are easy prey for coyotes. 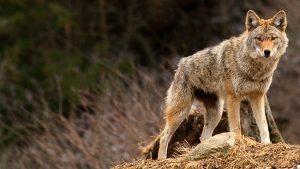 Some coyotes learn to kill livestock and pets and will do so repeatedly unless corrective action is taken. When preying on poultry and livestock, coyotes often kill more than they can consume. Normally, coyotes are elusive animals that avoid contact with humans. Most active after dusk and before daylight, they are typically seen only at a distance. 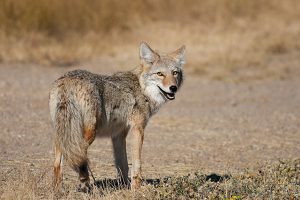 Within urban and suburban areas in California, however, some coyotes have adapted to residential neighborhoods, parks, and open spaces, and seemingly have lost their fear of humans. This may be a result of behavioral changes that have occurred over several generations of coyotes. A few coyotes have become increasingly aggressive toward humans. They will stalk and even attack children or adults, or attack pets being walked on a leash by their owners. While coyote removal often results in a void that is quickly filled by coyotes moving in from surrounding areas, this does not mean that coyote removal is ineffective in reducing or stopping damage. Coyotes moving in to fill a void may have different travel patterns and preferences for prey, thus reducing conflicts with humans, pets, or livestock. Recent research, as well as decades of practical field experience, suggests that removal of dominant coyote pairs at the beginning of breeding season may substantially reduce predation on livestock for up to a year. Removal of coyotes from a population may result in more resources being available to remaining coyotes, thus increasing litter sizes and pup survival. However, coyote removal does not result in higher coyote populations over the long term, as numbers are largely regulated by food availability. Areas with lush landscaping provide ample food, water, and shelter for coyotes. Suburban coyotes can reach densities far greater than they do on rangeland or undeveloped wild lands. Homeowners can reduce the attractiveness of their property to coyotes by clearing or thinning thick vegetation and by removing brush and dense weeds from the landscape, thereby depriving coyotes and their prey of shelter and cover. In particular, prune the lower limbs and branches of shrubs and small trees to a height of 2 feet, to deprive coyotes of cover where they can easily hide. Avoid using landscape plants that produce fruits and seeds, and pick fruit from trees before it falls to the ground to avoid attracting coyotes. Coyotes are attracted to ripening fruits of many kinds, and they will also readily consume the fruits of some plants commonly used for landscaping (Table 2). Install quality fencing around garden plots to exclude coyotes, as they will eat many common garden fruits and vegetables. Compost piles should be managed carefully so they will not encourage rodents or other prey attractive to coyotes, and they should be fenced or contained to exclude coyotes from foraging for grubs and worms. Eliminate available water sources for coyotes and other wildlife; for example, remove ponds or fountains, or install net wire fences around their perimeter. Manage bird feeders carefully to avoid spillage that attracts rodents and rabbits, which are attractive coyote prey. Cats and dogs should be fed indoors, or if fed outdoors, food dishes should be promptly emptied and removed after pets have eaten. Store pet food indoors or in sealed heavy-duty containers. Use refuse containers that have tight-fitting lids to prevent raccoons, dogs, or coyotes from having access to household garbage. Keep small pets such as cats, rabbits, and small dogs, indoors, or if outdoors, keep them within enclosed kennels. Large dogs should be brought inside after dark. Never allow cats or dogs to run free at any time, as they are easy prey. Because coyotes that come in contact with domestic animals may transmit diseases, vaccinate all pets for rabies, distemper, parvovirus, and other diseases, as recommended by a veterinarian. When exercising your dog, always use a leash, and walk only in populated areas of high pedestrian traffic. You may want to carry a walking stick or cane that you can use to fend off an attack. Try not to establish a regular routine in terms of route or time of day, as coyotes can learn your schedule and have been known to lie in wait to attack. Avoid walking pets at dawn or dusk, and avoid areas of dense vegetation or cover. 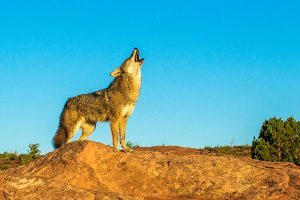 If you or your pets are approached by an aggressive or fearless coyote, try to frighten it away by shouting in a deep voice, waving your arms, throwing objects at the animal, and looking it directly in the eyes. Stand up if you are seated. If you are wearing a coat or vest, spread it open like a cape so that you appear larger. Retreat from the situation, by walking slowly backward so that you do not turn your back on the coyote. 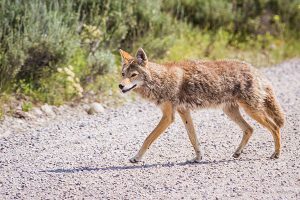 If you are bitten or scratched by a coyote, wash the affected area thoroughly with soap and water and then seek immediate medical attention. Although most problem coyotes are healthy, the risk of rabies is always present. Rabies can occur from a bite or scrape from an infected coyote, or if you handle your pet after it has been attacked and the coyote’s saliva comes into contact with broken skin or mucous membranes. Medical authorities typically recommend post-exposure immunization whenever a person comes into contact with a wild coyote during an attack.